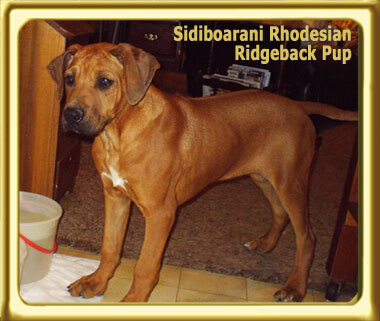 < A purebred Rhodesian Ridgeback Puppy. My name is Allex Michael and I am the writer director of the upcoming film Search Dog's Raven. Ebbey is the canine star of this film. I am the owner of Ebbey, a rescued Rhodesian ridgeback cross, and the author of Ebbey.com. I recently received an email from Psyche Williams who is long time breeder of Rhodesian ridgebacks and displeased with some of the ridgeback information on Ebbey.com. Psyche Williams: I do not expect the author to read this but I'm going to put my two cents in regarding the Rhodesian Ridgeback. Being a breeder of the ridgeback nearly 30 years and reading the authors comments about their intelligence convinces me the author got what little she knows from 10 cent profile books and certainly did not do her research. The author has given misleading information, researched outdated material and gives this ambidexrous canine much less credit than it deserves. It has been said many times the difference between man and animal is that animals can't reason but the author of that statement never owned a ridgeback. Allex Michael: If I am unfairly critical of the breed, it is out of concern that the ridgeback not be indiscriminately overbred like many dogs represented in film. You know the breeds of which I speak. Ebbey and her website Ebbey.com are already very popular with millions of hits. If the film Search Dog's Raven does well, people who fall in love with Ebbey will run out and buy a ridgeback. I just want to make them stop and think before doing so. Though Ebbey is likely not a purebred, and has issues from being an abandoned stray, her behaviors are very consistent with the breed. Like exceptional sight and scent capabilities (perfect for portraying a search dog in the film Search Dog's Raven), good problem solving abilities, plus admirable speed and power. Ebbey's over susceptibility to drugs also suggests ridgeback. I didn't know anything about ridgebacks until after adopting Ebbey. My first dog was a shepherd Bouvier cross and by attending a few obedience classes and committing to 15 minutes of training per day, she was an exceptionally well trained dog. She heeled off leash, sat when we stopped, rode on buses and would sit quietly while even the most boisterous of children lunged at her for a hug. When I adopted Ebbey, none of my training techniques worked. Granted, Ebbey was found starving in a garbage dump after being dumped, but she is the most difficult dog I have ever known. As a girl, my Mom took in stray dogs of all sorts and Ebbey outclasses all of them. Since there are no bad dogs, only bad trainers, I sought out to discover more about Ebbey's heritage. Ridgebacks are a less common breed, but I was able to find information on the web, from several dog breed books, a couple obedience instructors, from three ridgeback owners and from a lady who had bred ridgebacks for 12 years but then had to sell her property due to the economy. She is actually the person who told me Ebbey was either a ridgeback without the backwards growing back ridge or a ridgeback cross.